It's Tuesday again!!! These weeks are just coming and going, so fast!! You can tell he's just a grumpy old man, that just complains about everything!! We all know people like that, right?!?! I stamped my image with Memento Tuxedo Black ink and colored with my Copics. Patterned paper is from MME: Breeze, one of my favorite papers. I am almost out and I will have to restock really soon!! I rubbed walnut distress ink, on the edges of all patterned paper, before matting them down. Added a few buttons, ran with twine. Happy Father's Day, is stamped with Memento: Cocoa Brown on kraft cardstock. Great card Calypso and awesome photography. Love, LOVE those papers. Super cute card. Love this fun card- the DP is perfect and how cool-the way you added the fiber to your butttons! Wonderful paper and embellishments for a masculine, cute image too! Awesome design, love the papers you chose, wonderful coloring on Lyle (I just love him). Love the added buttons, twine and staples. 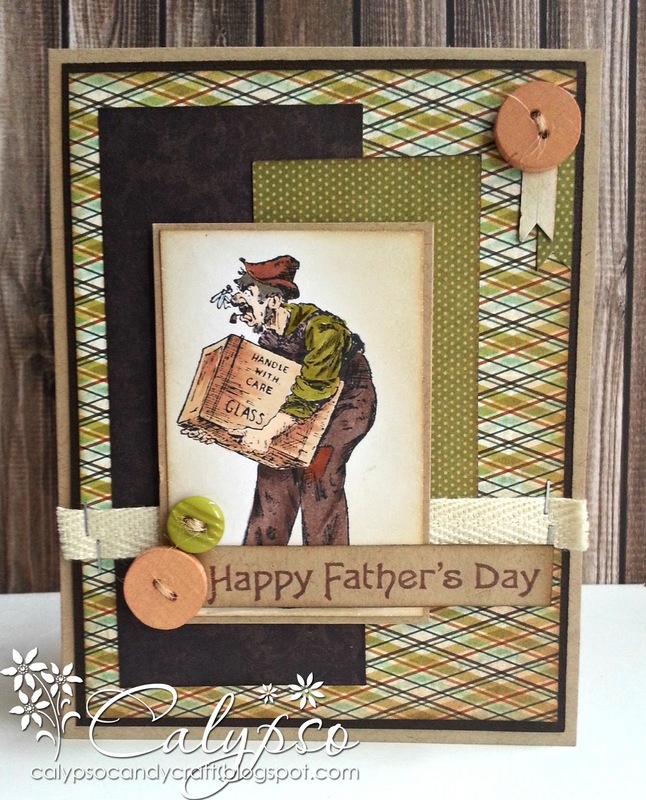 Love the layers on this card and the staples on the ribbon is awesome! Love this image - we were on the same wave length this week! Great card! Great Card, elements ,paper choices! Thanks for playing with us at Shop Pumpkin Spice! FAB card! Love the colors & sketch you used...thanks so much for playing with us this week @ ABC Challenges & hope to see you back again for our next challenge!!! Really great card I love that stamp too! You've coloured him brilliantly. Great creation for our challange this week - I love your image and design. What a lovely card!! Great design, love the image!! Thanks for joining us at Sketch Saturday this week and don't forget to enter our card candy! That image reminds me of my grandpa! Lol great colors and combination of papers. Great card! Love your shading and the colored DPs! Fabulous masculine card - he looks like he's working so hard :o) I love your mix of papers and the colors. the staples are the perfect touch! Thanks so much for joining us this week at ABC Challenges.